How many days of the week do you find yourself rushing out the door with no time to brew yourself a cup of coffee? When that happens, chances are you might decide to hit the drive-through at Starbucks. The only problem is that you're rarely the only person to decide to swing by Starbucks on the way to work, so you're likely to find a mile-long line of cars. Now, imagine if you could just text your order to Starbucks. When you arrive, your beverage is ready to go. No line. No waiting around. No more being late to work. That's the promise of Zipwhip's Textspresso, although I doubt we'll see it at a Starbucks any time soon. Zipwhip is a tech company that developed a cloud-texting service that allows you to send and receive texts from your computer. To show off this technology, the company created Textspresso, the world's first text-enabled espresso machine. Here's how it works: Simply send a text with your order to this robotic barista, and it will grab a clean mug, grind some beans, and brew you a delicious espresso. 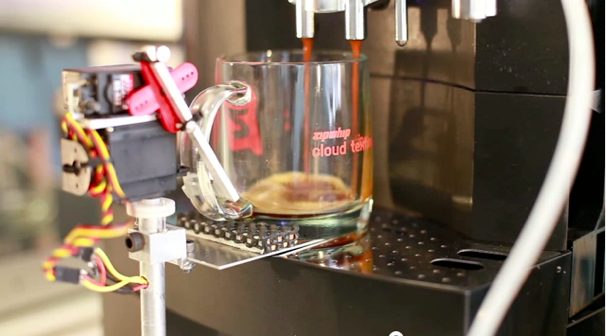 This nifty robot is basically a fancy espresso machine hooked up to a computer and a couple of robotic arms. The computer receives your order via text and relays it through an Arduino controller to the espresso machine, which then springs to life. The computer is set up to send texts back to you in order to let you know that it has received your order and to notify you when your drink is ready. Zipwhip has no plans to commercialize the Textspresso, but it does plan to open-source the build plans and code, so if you really need one of these machines in your house, you'll have to build one yourself. Then, on those really lazy days, you'll be able to text yourself a coffee without ever getting out of bed.